Wow! I am feeling so good about the plans and actions I have already put in place to organise my day better and to feel like I’m accomplishing my tasks by the time I close my laptop in the early evening. I have put into practice the Morning Brain Dump and a Daily Schedule which have made more of the time I have without the need to work late into the night or get everything done in one day. I feel better, I honestly do, now that I have some balance in my day. And no, it’s not the 9 – 5 kinda framework you get from a regular job. I have made my own structured day and it suits my lifestyle and my vision for my workday. Now that I’ve got the day to day stuff down, I wanted to have a little look at the bigger picture tasks which have been bothering me. My path to marketing has sometimes been a bit of a ‘scatter gun’ approach which has occasionally really paid off but often misses the mark too. I want to start getting some things clear in my mind about where my business is heading so I can really make headway on growing my following, sales and online presence. I’ve read about how to make a really basic marketing calendar at our good friend and guest poster, Lisa’s blog at Market Your Creativity here and I thought it would be the perfect place to start to get my head around things. This is not your boring old Marketing Plan that you find on a government website! That might be something which will help you in the future if you grow your business but for now, Lisa has the best idea with a simple and easy-to-follow plan which anyone can action. First things first – time off. Yes, seriously! I am always feeling like I’m paddling like mad and I honestly don’t even consider down-time. This is where I’ve been a bit remiss in the past and have not realised the effect the lack of ‘time off’ has had on my health and productivity. I am blocking out four chunks of time which will allow me to spend time with my husband, pottering in my home and on a bit of a holiday. Use your blocked out ‘time off’ to figure out the rest of your plan. Now it’s time to really start thinking about what I have been wanting to achieve with my business. What big picture things have I had on the boil but have not been able to get underway? For instance I have always wanted to release a Christmas line of candles and soaps but here’s the thing. I only remember when it’s too late to launch the line! Now I’m going to slot it into my calendar to make sure I get that plan underway in time and with purpose. 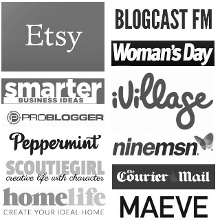 Blogging – I would love to start blogging regularly again and I’m going to tie this in with some seasonal launches of products and other plans I have swirling around. I am going to get a great calendar going with ideas which can help me to figure it out. Seasonal items and promotions – I will be planning out the seasons/holidays and which items I have that might suit those events (if any) and when I would need to be making, promoting and planning my cut-off dates for online orders. There are SO MANY other things which I could also add but I want to keep it simple this next year to see how much I can achieve with just these few goals. This is just a very rough annual guide so I am also going to be instigating a Google Calendar for my marketing plan which will have breakdowns of deadlines, reminders and (of course) my ‘time off’ plugged into it to help me remember and stay focussed. This exercise is definitely another one which you can do at home along with me but my critique for this technique will not be at the end of this week as usual since I will need a year to implement the plan. Instead, at the end of the week, I’m going to show you my calendar in all it’s scribbled, crossed-out and messy glory so you can see what I’m planning and then have a go for yourself if it looks useful to you. I’ve popped the printable below – I highly recommend getting it printed A3 so you have lots of room to write. Alternatively, sit down with some butchers paper and just map it all out yourself and really get into the nitty gritty stuff with bright pens, stickers, post-its – whatever helps YOU to plan your year. 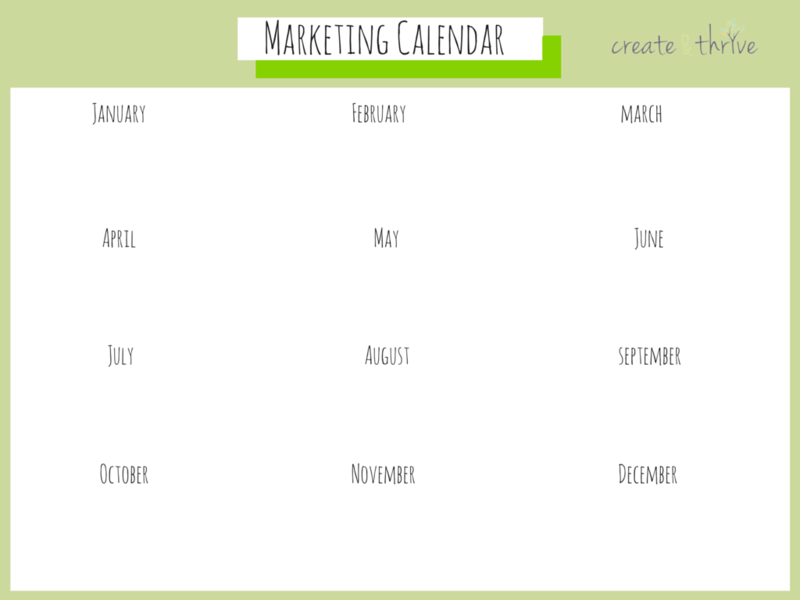 Have you done a marketing calendar before? If you are planning on starting one, what do you think will be your main areas of focus? Can you think of anything else you might add into your marketing plan that I haven’t listed above?